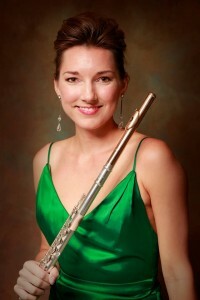 The Utah Symphony’s new principal flute, Mercedes Smith, will be featured in two upcoming chamber concerts: Thursday at the Deer Valley Music Festival, where she will play Debussy’s Syrinx and Dutilleux’s Sonatine for Flute and Piano; and next Monday at the Intermezzo Chamber Music Series, where she’ll play Mozart’s Flute Quartet No. 1 in D major, K. 285, and Debussy’s Sonata for Flute, Viola and Harp. Reichel Recommends had the opportunity to interview Smith by email last week while she was at the Festival Internacional de Musica de Camera in Mexico. Below is the interview. RR: Tell us about the festival in Mexico. How often have you been there and what will you be playing? MS: It’s my first year here at the Festival Internacional de Musica de Camera in Zacatecas, Mexico. We are playing chamber music from a wide range of composers, everyone from Marquez and Angulo to Spohr and Mozart. We are also teaching master classes to college students from all over Mexico. The festival was founded by a great Mexican clarinetist, Luis Humberto Ramos, and is sponsored by the University. Zacatecas is a beautiful colonial city that was established in the 1500s and has cobble stone roads, narrow alleys and many impressive cathedrals. RR: You’ve got two concerts coming up when you return to Utah, and you’ll be playing a wide range of pieces, from Mozart to Dutilleux. Tell us about Mozart’s Flute Quartet No. 1, K. 285. MS: The Mozart Flute Quartet in D major is written in concertante style and is a sort of chamber concerto for the flute. The second movement is a little more unusual in that it features the flute very lyrically while the strings provide a pizzicato accompaniment. RR: Have you played the Dutilleux Sonatine for Flute and Piano before? What can the audience expect in this piece? MS: The Dutilleux Sonatine was composed as a test piece at the Paris Conservatory. I have played it many times for competitions and performances; in fact the last time I played it was for the National Flute Association Young Artist Competition. The piece displays the full range of the flute and its capabilities – demanding technical passages, fast articulated passages and beautiful French lyricism. RR: What is it with Debussy’s Syrinx that makes it so wonderful? Is it a demanding piece for the player? MS: Syrinx is not considered a demanding piece. It is so wonderful, and one of my favorites, because it is meant to sound improvisatory. It’s the song of Pan singing to his unrequited love Syrinx. He calls to her and he hears no answer. He calls again and there is still no answer, and then he continues his lament which reaches a height of passion and then slowly wanders back into forlorn resignation. It provides the opportunity to display a wide array of tone colors and infinite possibilities for interpretation. RR: Among the pieces you’re doing at these two concerts, do you have a particular favorite? MS: I’d say I particularly love the Debussy Sonata for Flute, Viola and Harp. The music of 1910-1920 encompasses many of my favorites: Debussy’s Syrinx, Stravinsky’s ballets and Ravel’s Daphnis and Chloe. All of these composers were especially generous to the flute. RR: Let’s talk a little about your background. Why did you take up the flute? How old were you when you started? MS: I have no idea what possessed me to chose the flute, but in junior high school we all had to pick instruments and for some reason I HAD to play flute. I guess I thought it was the most glamorous or something. I started when I was 11 years old in a public school band program. After my first year of flute I was homeschooled and continued to take private lessons. RR: Was the flute your first instrument? Do you play any other instruments? MS: Other than a very brief and failed attempt at cello when I was five years old, the flute was my first instrument. I can’t claim to play any other instruments, although I do regularly play piccolo, alto flute, and sometimes even recorder or penny whistle. RR: Do you come from a musical family? MS: I wouldn’t say I come from a musical family, but we always had a piano in the house and my mother would often play Broadway show tunes, Rodgers and Hammerstein hits and love songs from classic movies. I think Moon River was a childhood favorite which probably spurred my later obsession with Audrey Hepburn. RR: Who was your principal teacher? MS: I was fortunate in high school, living in small town Arkansas, to have a very good teacher, Dr. Ronda Mains, who was able to prepare me to study at a conservatory. When I was 17 I began studying with Jeanne Baxtresser, former Principal Flute of the New York Philharmonic, at the Manhattan School of Music. I studied with her my first few years, and later I studied with Michael Parloff, former Principal Flute of the Metropolitan Opera Orchestra. Ms. Baxtresser helped me to get my sound and vibrato on the right path and, of course, I credit Mr. Parloff with teaching me opera excerpts, which helped me to land my first job at Houston Grand Opera. RR: Before coming to Utah you were principal with the Houston Grand Opera and Houston Ballet. Although you still play opera now, do you miss not playing it regularly? Do you enjoy playing symphonic repertoire? MS: I do miss being inspired by great singers year round. The first opera I played in Houston was with Renée Fleming, so I was spoiled from the start. I would say my playing and sound concepts have been greatly influenced by all the great singers I was fortunate enough to hear every night at Houston Grand Opera. RR: Any chance you’ll be doing a recital in Salt Lake City in the near future? MS: I am certainly open to any opportunities that may arise! Deer Valley Music Festival, July 25, 8 p.m.: Temple Har Shalom (U-224 at Brookside Ct., Park City) – Program: Fauré, Dolly Suite; Dutilleux, Sonatine for Flute and Piano; Debussy, Sonata for Flute and Violin and Syrinx for solo flute; Ravel, Piano Trio in A minor. Performers: Mercedes Smith, flute; Ralph Matson, violin; Matthew Johnson, cello; Jerry Steichen and Jason Hardink, piano. Tickets are $32 for general admission and $10 for youth 8-18 years of age and can be purchased by calling 801-533-6683 or going online to www.deervalleymusicfestival.org. Intermezzo Chamber Music Series, July 29, 7:30 p.m.: Vieve Gore Concert Hall, Westminster College – Program: Mozart’s Flute Quartet No. 1 in D major, K. 285; Turina, Sextet for Viola, Piano and String Quartet, op. 7 (Escena Andaluza); Arriaga, String Quartet No. 3 in E flat major; Debussy, Sonata for Flute, Viola and Harp. Performers: Mercedes Smith, flute; David Porter and Julie Wunderle, violin; Brant Bayless and Julie Edwards, viola; John Eckstein, cello; Louise Vickerman, harp; Kimi Kawashima, piano. Tickets are $18 for general admission and $25 for seniors and available at the door or online at www.intermezzoconcerts.org. Students are admitted free with ID.